Okay, I realize that Thanksgiving isn't even here yet, but this idea needs to be shared early. I read a post from someone looking for inexpensive Christmas gifts that are also meaningful, and this one is so good, instead of just posting a comment on her site, I want to share it with anyone who reads this blog. Please be patient with the delivery, as there is more to the story. 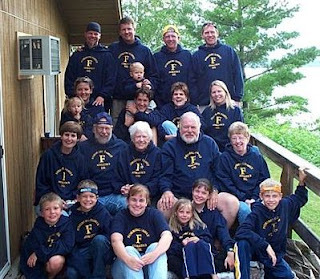 In July of 2002, we had a 4444 family reunion. Everyone has them, of course, but this one was special (how special, I learned only later). It was the first-ever 4444 reunion. My husband's entire extended family consists of 21 people. We rented a group of beautiful cottages on Leech Lake, in Minnesota, and stayed for a week; fishing, swimming, boating, etc. Having lived a simple life, Gram was thrilled to take part is such a big event, especially one that involved all of her loving family. 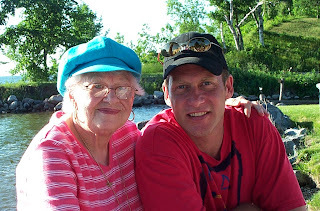 Family was everything to Gram, so she was in her glory that week; grandchildren and great grandchildren loving her up and sharing their "big" catches, found turtles, cribbage games, and lazy times, too. As the unofficial family photographer, I took many, many photos that week. In the back of my mind, I knew these snapshots would be priceless gems in our family, since Gram was getting older and who knew when we would have another reunion like this one. The following October, I purchased a postcard program (cheap) and made 18 photo postcards from our time at Leech Lake. I then began to send them to Gram at her home in Calumet, Michigan. Each week, I sent one memory, signed by my husband, the kids, or me. Each week, she excitedly awaited her mailman's visit, receiving the cards and reminiscing about her joyous summer trip. The postcards were featured on her coffee table in a place of prominence, offering her something to share with anyone who came to call. Sitting in her living room, snow up to the windows, Gram did not feel isolated. She felt loved and thought about. She received the last photo (a sunset over the lake) the week before Christmas. We then picked her up and drove her the four hours to Green Bay to celebrate the holidays with us. Gram proudly brought her stack of postcards and shared them with anyone who would give her the audience. They were a badge that showed how much she was blessed and how much her family loved her. Sadly, two days before Christmas, my husband's dad (Bob) found his mother had passed way in the night. She had died of a stroke. Of course, we were all deeply affected by the loss of Gram, but Big Bob was devastated. Six weeks later, we suffered another loss when he, too, passed away. The death certificate said massive heart attack, but we knew it was a broken heart. So you see, a simple, yet thoughtful gift for Christmas does not need to be expensive, and it doesn't need to wait until Christmas. The last postcard Gram received was (ironically) a sunset. She died happy, fulfilled. She knew that she was loved, and she knew that she was an important part of our family. You can't get that with a box of sugar-free candy, a store-bought sweater, or a trinket for the coffee table. Give a gift of love, and you will never be sorry. P.S. And don't keep saying, "We should plan a family reunion." DO IT! We're glad we did. P.P.S. I personally like Snapfish for printing photos, but if you Google Photos to Postcards, I'm sure you'll find a site to help you. What a sweet story. It so great to have no regrets about showing someone you loved them before they passed away. I'm sorry to hear about your parents. It's a lovely story, and it sounds as if you all had a blast together. She knows that she was truely loved by her family. I love your idea of the postcards. Hope you and your family have a great Thanksgiving! !